Cleveland Cavaliers Rookie, Collin Sexton. Last June, Cleveland Cavaliers General manager Koby Altman told reporters that the Cavaliers will be in the player development business for the “first time in a long time”, following the departure of Lebron James to the Los Angeles Lakers. So far, Altman has delivered on that promise. With the selection of Alabama point guard, Collin Sexton, with the eighth-overall selection of the 2018 NBA Draft, the Cavaliers took their first step towards their current rebuild. While the Cavaliers continue to try and acquire young talent and draft picks while phasing out the older veterans from their roster, the Cavaliers rebuild starts and focuses around Sexton (at least until June when presumably, either R.J. Barrett or Zion Williamson plus another first-round selection are added to the wine and gold’s roster). Whether Sexton can be a legitimate piece to build a contending core around is still to be determined over the next several seasons. For now, however, Sexton has quietly had a very solid rookie season and has continued to show solid improvement throughout the season. The first thing you notice about Sexton is that he is all heart on the court. Sexton gives everything he has on the hardwood and nothing less. This was first made public when during a game last season between the Alabama Crimson Tide and the Minnesota Golden Gophers at the Barclays Center, where the Crimson Tide at one point in the game were playing 3-on-5 basketball for an extended period in the second half of the game. In such an outrageous scenario, one would expect a quick, merciful slaughter of the opponent; not with Sexton on the court. Leading the herculean effort as a true freshman point guard, Sexton and the Crimson Tide outscored the Gophers 30-22 while playing 3-on-5 with Sexton leading all scorers in the game with 40 points. If any game in Sexton’s career displays just how much heart that this young man plays with, the ludicrous performance against Minnesota just does that. Overall, Sexton averaged 19.2 points, 3.8 rebounds, and 3.6 assists per game in his lone season at Alabama. While the assist numbers are low, you have to keep in mind where Alabama is this season without Sexton, and that’s sitting at home in Tuscaloosa watching the NCAA tournament. Sexton’s shooting percentages were pretty good overall, shooting 44.7% on all field goal attempts, including 33.6% from three-point range. All in all, the Cavaliers were convinced that Sexton was their man to replace Kyrie Irving as the long-term point guard for their franchise. When you look at Sexton’s season, his numbers may not initially jump out at you as eye-opening. At 16 points 3 rebounds, and 3 assists per game, Sexton still has tons of room to further improve, but at just 20-years-old and playing with a roster of mostly filler players through the rebuilding process, Sexton has done plenty well. Sexton is shooting 42% overall from the field as a rookie. Most impressive though is the fact that Sexton is shooting 41% from three-point range. That ranks fifth among all point guards who get regular playing time in the NBA, and most impressively, first among all rookies getting consistent minutes in basketball. That means Sexton is the best rookie three-point shooter in the NBA this season. Considering that one year ago at this time, Sexton was barely over 33% as a three-point shooter, you can already see just how much the “Young Bull” has developed his shooting ability to a very consistent level. For many advanced stats, it is not fair to judge Sexton on having negative scores because of just how awful the 18-53 Cleveland Cavaliers have been this season. One stat that I notice with Sexton is his 51% true shooting percentage. Usually, anywhere around 50% is considered league average, so while Sexton has become an improved three-point shooter, he is still only a 42% shooter from two-point range, which you would like to see him develop to somewhere between 45% and 50% in the near future. The biggest question mark on Sexton’s game right now is whether or not he is really a point guard at the next level. Even at Alabama, Sexton had low assist numbers, so this is nothing new. Yes, his flurry of random teammates who probably get more minutes than they should combine with injuries and trades of star players make it difficult to find consistent chemistry with your teammates and find guys who can create their own points, but 2.9 assists per game are still really low. This leads to the question of whether or not the Cavaliers would consider drafting Ja Morant if they are in the position to in June and consequently, then move Sexton to shoot the guard and let Morant play the point. Sexton’s 25.3% usage percentage ranks him within the top 50 in the league, including one of three Cavs in the top 50 (Jordan Clarkson and Kevin Love are the other two). This means the Cavaliers offense really has relied on these three players to either get or contribute to the scoring of the vast majority of all their points, pointing to just how much faith the Cavaliers have already placed into their young point guard. However, an assist percentage of just 15.4% ranks Sexton with Ivan Rabb, JJ Reddick, Wesley Matthews, Gary Harris, and Rodney McGruder. None of those players besides Sexton are point guards. Again, I will wait to pass judgment on Sexton and his passing game until the Cavaliers have supplied him with a sustainable core of legitimately contributing pieces. One of the most interesting facets of Sexton’s offensive game is his shot chart. 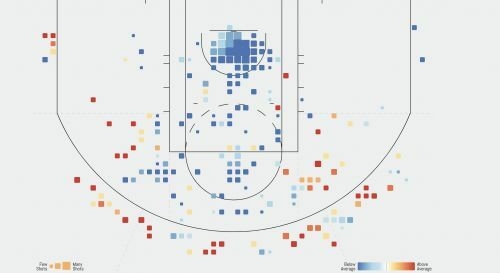 While Sexton loves the top of the key, the left side of the key, and the mid-range area between the paint and the three-point line, he seems to hate the corner three-pointer as well as the baseline area. Sexton has attempted just five three-point attempts from the right corner all season (made two). On the contrary, in that middle area between the paint and the top of the key, Sexton has taken 100 shots (making 35). 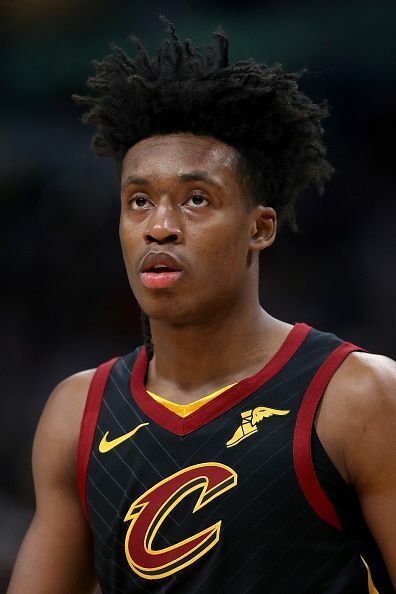 Whether or not Collin Sexton is a point guard who can be a serious member of the new young core the Cavaliers are trying to build remains to be seen. While Sexton is still very young and very raw, Sexton is über talented and an extremely hard worker who fights with every inch of blood, sweat, and tears that he has on the court, and that effort can go a long way as a professional basketball player.